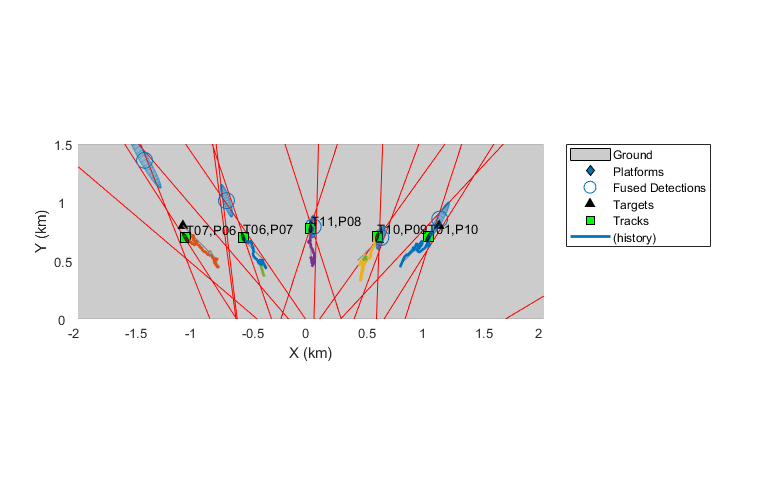 Use Sensor Fusion and Tracking Toolbox™ to simulate autonomous tracking systems, to estimate pose (position and orientation) and velocity using a variety of sensors, and to track multiple point and extended objects. Generate an air traffic control scenario, simulate radar detections from an airport surveillance radar (ASR), and configure a global nearest neighbor (GNN) tracker to track the simulated targets using the radar detections. This enables you to evaluate different target scenarios, radar requirements, and tracker configurations without needing access to costly aircraft or equipment. This example covers the entire synthetic data workflow. Fuse radar detections from a multiplatform radar network. The network includes two airborne and one ground-based long-range radar platforms. 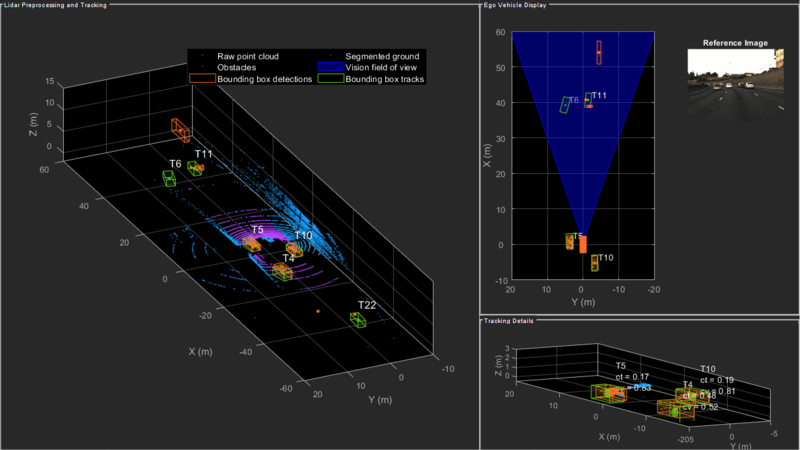 See the Multiplatform Radar Detection Generation example for details. A central tracker processes the detections from all platforms at a fixed update interval. This enables you to evaluate the network's performance against different target types and maneuvers as well as platform configurations and locations. Simulate a multifunction phased array radar system. A multifunction radar can perform jobs that usually require multiple traditional radars. Examples of traditional radars are scanning radars, which are responsible for searching targets, and tracking radars, which are responsible for tracking targets. In this example, the multifunction phased array radar performs both scanning (searching) and tracking tasks. Based on the detections and tracks obtained from the current echo, the radar decides what to do next to ensure that targets of interest are tracked and the desired airspace is searched. The multifunction phased array radar works as a closed loop, including features such as task scheduling, waveform selection, detection generation, and target tracking. Simulate bistatic range-only detections using four sensor-emitter pairs. In addition, this example demonstrates how to localize and track multiple targets using bistatic range-only measurements. Track extended objects. Extended objects are objects whose dimensions span multiple sensor resolution cells. As a result, the sensors report multiple detections of the extended objects in a single scan. 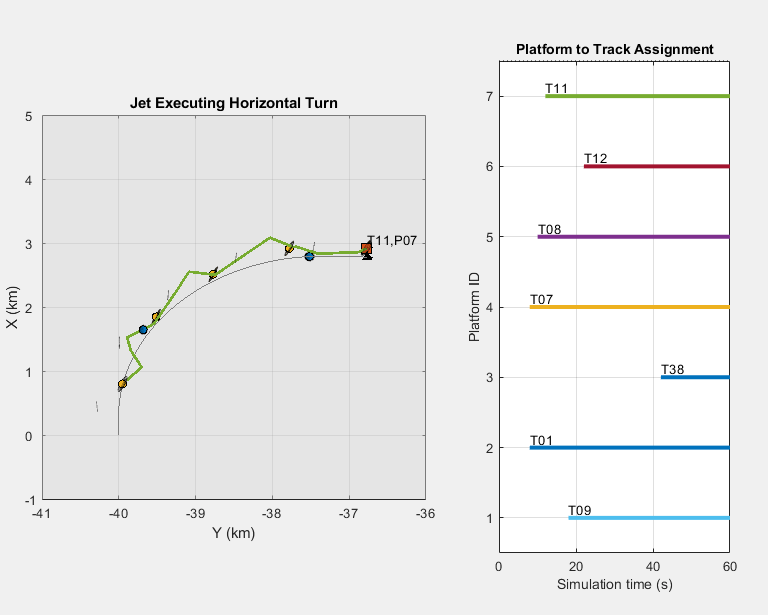 In this example, you will use different techniques to track extended objects and evaluate the results of their tracking performance. Track vehicles using measurements from a lidar sensor mounted on top of an ego vehicle. Lidar sensors report measurements as a point cloud. 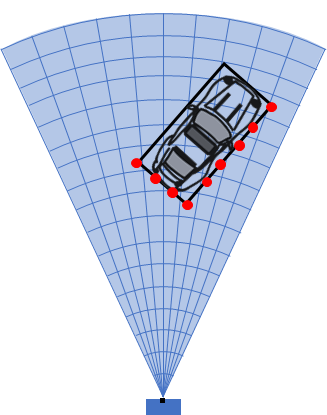 The lidar data used in this example is recorded from a highway driving scenario. In this example, you use the recorded data to track vehicles with a joint probabilistic data association (JPDA) tracker and an interacting multiple model (IMM) approach. Illustrates the tracking of objects using measurements from spatially-distributed and synchronous passive sensors. In the Passive Ranging Using a Single Maneuvering Sensor, you learned that passive measurements provide incomplete observability of a target's state and how a single sensor can be maneuvered to gain range information. Alternatively, multiple stationary sensors can also be used to gain observability. In this example, you will learn how to track multiple objects by fusing multiple detections from passive synchronous sensors. Generate a marine scenario, simulate radar detections from a marine surveillance radar, and configure a multi-target Probability Hypothesis Density (PHD) tracker to estimate the location and size of the simulated ships using the radar detections.